Defreeze and drain wild blueberries. Wash the arugula and chop roughly. Save ¼ of it. Mix eggs, season with salt and pepper and stir in ¾ of the arugula. Heat 1 tbsp. of oil for each omelet in a small pan. 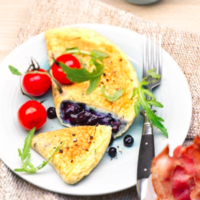 Add ¼ of the mixed eggs, sprinkle with blueberries and let it set. Prepare four omelets this way. Meanwhile heat 1 tbsp. olive oil in a separate frying pan and sweat the cocktail tomatoes. Season with salt, pepper and sugar. Garnish omelets with arugula and tomatoes. Tip: Serve with crispy bacon or grated cheese.